Does Chevy upgrade the 2018 Trax sufficiently? This is the best subcompact crossover for you if you’re looking for a utility vehicle that acts more grown up than it might look. Trax is Chevrolet’s entry-level crossover and was among the initial entries in the subcompact crossover segment. This four-door wagon is based on Chevy’s Sonic subcompact car and shares much of its underskin engineering with Buick’s premium-class Encore subcompact crossover. Parent-company General Motors imports Trax and Encore from South Korea but builds the Sonic in the U.S.
Trax went on sale in North America for the 2013 model year. It’s never been the best looking, best handling, fastest, or most fuel-efficient offering in its rapidly expanding class. But it acquits itself well enough in all those areas to attract a good number of entry-level crossover shoppers. The Jeep Renegade remains the top seller in a competitive set that includes the Honda HR-V, Subaru Crosstrek, Nissan Rogue Sport, and the new Ford EcoSport and Toyota C-HR. Trax is holding its own, though, with sales up more than 25 percent through the first half of calendar 2017. Some of that demand was fueled by a significant model-year ’17 freshening that brought more features and more handsome exterior styling. Buy a 2018 for its tweaked feature set: the flagship model gets a host of standard equipment that was previously optional, and there’s a new sporty appearance package. The 2018 Trax lineup returns with three models: base LS, volume-selling LT, and flagship Premier. All share a four-cylinder engine and are available with front-wheel drive or optional all-wheel drive (AWD). Wait for the 2019 Trax if you want to roll the dice on Chevy making important driver-assistance features standard across the board. Currently, these safety items are standard only on the Premier, optional on the LT, and unavailable on the LS. The next fully redesigned Trax is on track for model-year 2021. Styling: “Storm Blue Metallic,” “Sandy Ridge Metallic,” and the extra-cost “Cajun Red Tintcoat” replace Crimson, Orange Burst, and Blue Topaz metallic on the Trax’s paint palette. Otherwise, this subcompact crossover sees no appearance changes for 2018. Its styling was overhauled for 2017 with a new grille, updated rear fascia with available LED taillights, and redesigned instrument cluster, and upgraded infotainment interface. The ’17 Trax’s front-end styling helped usher in the look of the next-generation of Chevy crossovers, including the redesigned 2018 Equinox and Traverse. Still, at just 14 feet long but nearly 5.5 feet tall, Trax remains a little oddly proportioned. We think it falls somewhere between the graceful lines of the rival Mazda CX-3 and the Mad Max angles of the competing Toyota C-HR. Happily, the tall roofline results in a surprisingly spacious cabin. Headroom is excellent all around, and there’s adult-worthy rear legroom, thanks to chair-height seating. Aging boomers take note: the rear doors could open a touch wider, but situating yourself in this cabin is otherwise very easy. Cargo capacity is class-competitive, with 18.7 cubic feet with the rear seatbacks raised and 48.4 with them folded. 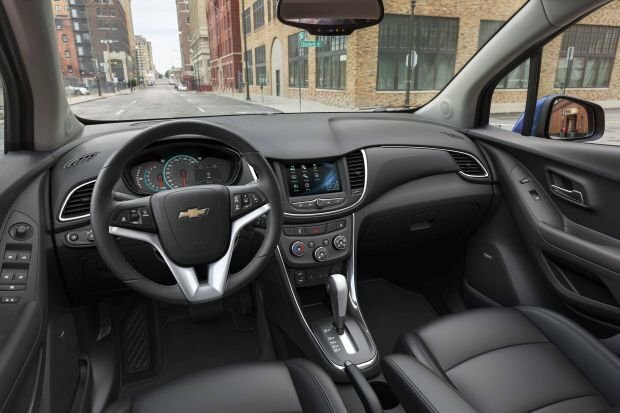 Chevrolet replaced the 2013-2016 Trax’s odd, motorcycle-inspired digital instrument cluster with traditional analog gauges for 2017, a change for the better. In a nod to the fully connected millennials the company targets, there’s no CD player. Apple CarPlay and Google Android Auto are standard. In-vehicle 4G LTE Internet access is available through GM’s OnStar telematics, but imbedded navigation is not offered on the Trax. The only way to display GPS mapping on the dashboard touchscreen is with a connected smartphone via CarPlay, Android Auto, or the third-party BringGo Nav-Link app. Mechanical: All 2018 Trax models continue with a 1.4-liter turbocharged four-cylinder that makes 138 horsepower and 148 pound-feet of torque. The sole transmission is a 6-speed automatic. The drivetrain has sufficient scoot for around-town commuting, and there are enough reserves to calm your nerves when merging with fast-moving freeway traffic. The transmission is occasionally sluggish to downshift when more power is needed, but this is far from a deal-breaker. The related Buick Encore offers a more powerful version of this engine, and it would be nice if it were available on the Trax as well. 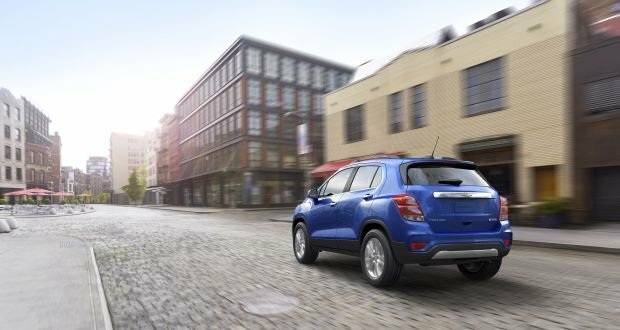 If it’s not be the quickest vehicle in the competitive set, Trax is arguably the most refined. The cabin is very quiet, and the switchgear operates with precision you wouldn’t expect at these prices. The LS and LT have 16-inch wheels and tires and ride remarkably well. Premier models and LTs equipped with the new Redline Edition Package use 18s that enhance cornering grip at the cost of bump absorption. Try before you buy. In this class, Chevy surrenders off-road pretensions to the Jeep Renegade and Subaru Crosstrek. Trax has just 6.2 inches of ground clearance, less than an inch more than that of a car. The available AWD system is mostly for improving traction in snow and does little to improve dry-road handling. Budget-watchers and folks living in snow-free climates can safely skip this option. Features: The Trax Premier sees the bulk of feature changes for 2018. Previously optional, a power sunroof is now standard. And forward-collision and lane-departure warning join standard blind-spot and rear cross-traffic detection. No Trax is available with autonomous emergency braking so this crossover isn’t eligible for Top Safety Pick status from the Insurance Institute for Highway Safety. However, it does score well in crash testing and comes standard with 10 airbags, including ones that protect the torsos of rear-seat occupants in a side-impact collision. The new Redline Edition Package for the LT includes specific wheels, blackout exterior trim, and upgraded seating surfaces. Ironically, you can’t order this package with a red exterior paint color; it’s available only with silver, white, or black. Premier versions offer the Midnight Edition Package, which includes similar black exterior trim, wheels, and unique “Jet Black” leatherette upholstery. As the entry-level Trax, the LS is basic but does come with a rearview camera, a fold-flat front-passenger seat, and the aforementioned connectivity advantages of CarPlay, Android Auto, and onboard WiFi hotspot. The LT adds LED taillights and daytime running lights, upgraded cloth upholstery, cruise control, satellite radio, and remote engine start. Cruise control is available on the LS, but there’s a catch – it’s offered only to fleet and commercial purchasers, not the retail public. 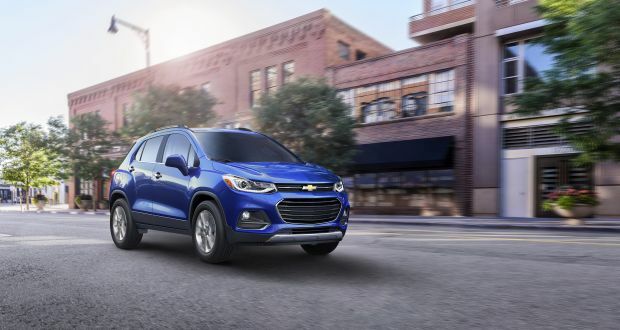 In addition to the sunroof and extra safety aids, the Trax Premier has fog lights, faux leather upholstery, a power driver’s seat, heated front seats, Bose-brand audio system, and keyless access with pushbutton ignition. LS and LT models see a modest price hike of $50 for 2018, attributed entirely to an increase in the manufacturer’s destination fee, to $945 from $895. Premier models are $1,245 more expensive, owing to this year’s extra standard equipment. All base prices listed here include the destination fee. With front-wheel drive, the 2018 Trax LS starts at $21,945, the LT at $23,845, and the Premier at $28,240. AWD adds $1,500 across the board and replaces the front-drive LS’ steel wheels with aluminum ones. Chevy had not released options prices for the 2018 Trax in time for this review, but don’t expect them to change much from the cost of those available on the 2017 model. The only factory option of significance for the LS is the Cargo Package ($110 for 2017) that includes a cargo mat and net. On the LT, the Convenience Package ($450 for 2017) again adds keyless entry, pushbutton ignition, power driver’s seat, leatherette seat inserts, and a leather-wrapped steering wheel. Selecting this package opens access to the Sun and Sound ($1,400 for ‘17) and Driver Confidence ($495) packages. The former includes a power sunroof and Bose-brand audio system. The latter adds rear-obstacle and blind-spot alert, and rear cross-traffic detection. Expect the new LT Redline Edition Package to run around $1,000. The Premier model -exclusive Driver Confidence II Package ($295 for ‘17) adds forward-collision and lane-departure warning systems. Anticipate the Midnight Edition to be priced around $1,000. For a bottom-line sticker of less than $25,000, a front-wheel drive LT with Convenience and Driver Confidence packages gets you the most for your money, although we do consider the $1,500 AWD system a wise choice. 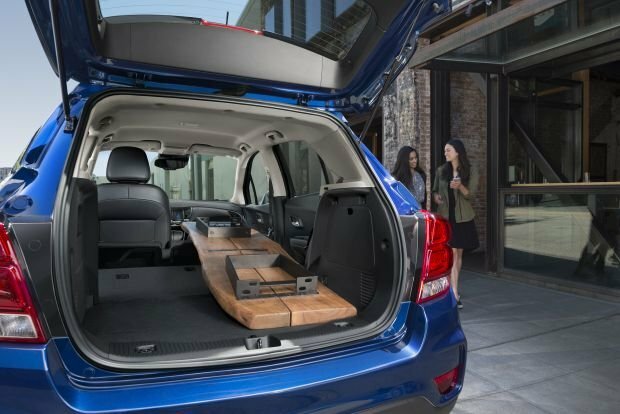 The Trax Premier has an appealing list of standard and optional features, but at a price point approaching $30,000, a larger, compact-class crossover, such as the Chevrolet Equinox 1LT model, is a better value. EPA fuel-economy ratings for the 2018 Trax were not released in time for this review, but with no changes to powertrain, they should mirror Trax’s 2017 ratings: 25/33/28 mpg city/highway/combined with front-drive and 24/30/27 with AWD. Given Trax’s small size and power relative to larger compact-class crossovers, these ratings are not outstanding. All models use regular-grade 87-octane gasoline. The next major update for the Trax isn’t likely to happen until model-year 2021, when it will be fully redesigned. It’s not liable to grow much in size, and it should retain a turbocharged four-cylinder engine for power. The transmission will likely be upgraded to an 8-speed automatic or maybe even a continuously variable unit, similar to what Chevrolet has on its Spark subcompact car. Production of the next-generation Trax will likely continue in South Korea, though it’s possible the company could move it to China in order to save costs. This may depend on how well the Chinese-made Buick Envision compact crossover does in terms of reliability. Fiat 500X, which has cheeky Euro-chic styling, but lags the Chevy for passenger comfort, ergonomics, and reliability; Mini Cooper Countryman, which is sportier, but also suffers from subpar quality and relatively astronomical prices; Mitsubishi Outlander Sport, a somewhat crude crossover fundamentally unchanged since its model-year 2011 debut, from a brand whose future in the United States remains uncertain. Honda HR-V, the gold standard for road manners and cargo versatility in this class; Jeep Renegade, while its reliability is questionable, its style, comfort, and off-road capability are not; Nissan Rogue Sport, rivals the Trax for refinement, tops the class it for styling, and comes standard with autonomous emergency braking for 2018.